Editing Modes. 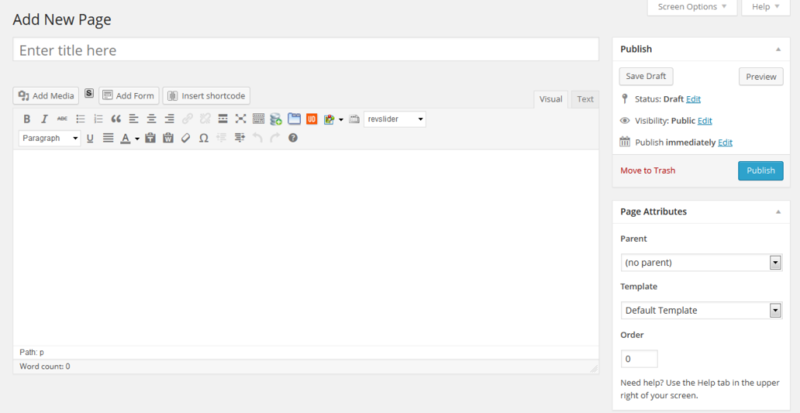 There are two modes in which to edit your content in WordPress: using the Visual mode tab or the Text (HTML) mode tab, both at the upper right of the content box. In most cases you will use the default Visual mode as it presents in a “what you see is what you get” method. In the event that you need to do more advanced editing to the end product using HTML, you can use the HTML mode tab which will show all the coding markup while you edit. If you are unfamiliar with HTML, it is unlikely you will need to use this. Your WordPress page can contain much more than just simple text. 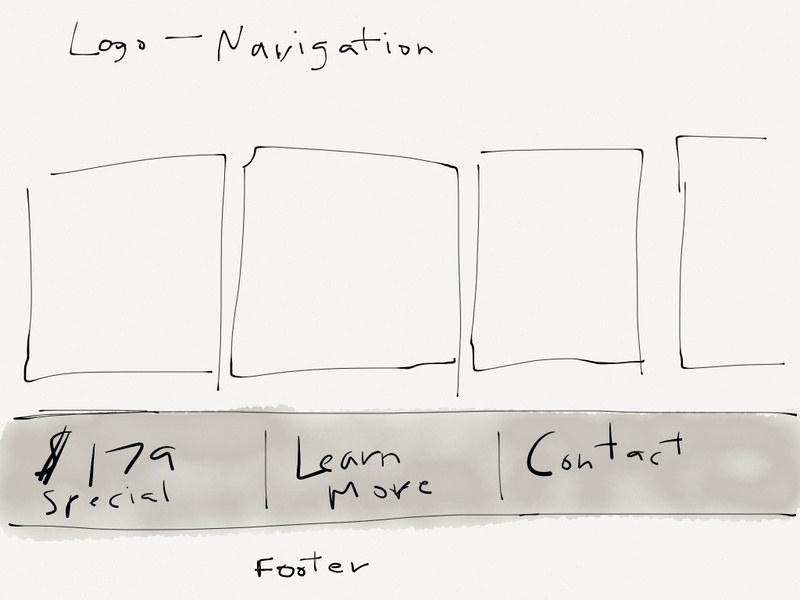 Choose where your new page will appear in the navigation menu. This is accomplished in the right sidebar under Attributes (see below screen shot). If your new page is going to be a top level item on the menu bar, you can leave the default Parent selection of “Main Page (no parent)”. 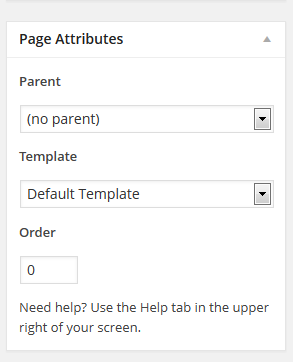 However, if you would like your new page to show as a sub-menu item under a parent, then choose the menu item you would like to be its parent. 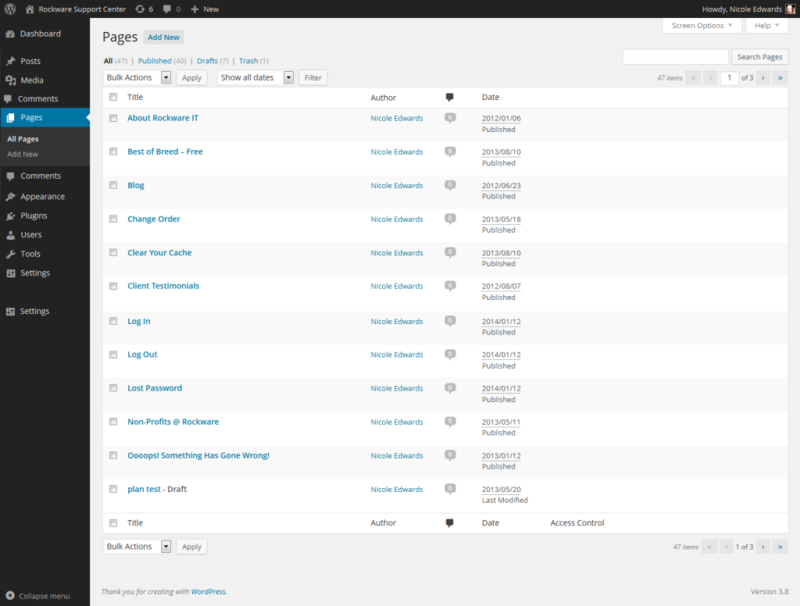 Next, if your WordPress theme has multiple templates for page layouts, pick the one that fits the way you want your new page to be displayed in the Template drop-down menu. Lastly, under Order is a box with a zero in it by default. If you replace this with a number, it will designate which order position your new page will appear in either the Main Menu or Sub-Menu, depending on whether you chose a parent and if there are other items in it’s same menu location. Obviously, in the left hand menu, instead of choosing “Pages”, or the “Add New” underneath “Pages”, you’ll choose “Posts” or the “Add New” under “Posts” in the left hand sidebar menu. When previewing the post, it will take you to the single page for that post – however, when you publish a post, it will automatically render in the blog portion of your website, so check there too to see the new edition.